The SIUE STEM Center announces its FY20 faculty research fellowship program. This is a competitive fellowship, open to tenure-track or tenured faculty members, to engage in undergraduate education research aligned with the mission of the STEM Center to innovate ways to engage students in STEM. The successful applicant will be a faculty fellow with the STEM Center beginning in summer or fall of 2019, during which time the applicant will conduct a faculty-initiated research project. To support the faculty member’s research, the STEM Center will pay for one course release during the academic year and upon completion of the project, the fellow will be supported for travel to one conference to present the findings of the study. The STEM Center seeks to fund projects that have the potential for contributing to improvements in undergraduate science (including health science), technology, engineering, and mathematics teaching and learning at SIUE. Projects that will develop, test, and study innovative instructional practices with the potential for replication across departments are especially encouraged. Several studies have shown the value of active learning in large introductory courses, course-based undergraduate research experiences (CUREs), project-based learning (PBL), service learning, and similar student-centered teaching approaches for improving course completion rates and retention in STEM majors (Bangura & Brownell, 2013; Graham, 2013; Freeman et al., 2014; Kober, 2015). Projects focusing on these and other potentially transformative approaches to learning are encouraged. Funding for one course buy out for one semester during the fellowship. Travel funding, upon completion of the research report, to present research finding at a state, regional or national conference up to $1,500 – reimbursement in accordance with State of Illinois rules and requirements. Staff expertise for data collection and analysis. Research report on findings. The research report should be completed by June 30, 2020. Research presentation at an SIUE event or by arrangement with the STEM Center for the benefit of the university community. Research presentation at a state, regional, or national conference (funded by the fellowship). Collaborative external grant proposal planning with the STEM Center to extend the project impacts. Application form with Chair/Director’s and Dean’s signature. Justification for project based on the literature and SIUE undergraduate education needs. How the project relates to the STEM Center mission. How the project relates to the applicant’s area of expertise. Brief description of data collection and analysis to be conducted. Detailed timeline (work must be completed by June 2020 and ready for presentation). Projected deliverables, including research report, potential external grant submissions, peer-reviewed journal articles, and presentation at a conference. Applications are due March 25, 2019 and award(s) will be made by April 1, 2019. IRB approval should be sought as soon as the applicant is notified of the award. Note: A contract will be made between the applicant and the STEM Center to reflect a commitment to the deliverables proposed in the project. Travel funding will be available after the completion of the research report. Decisions will be made by the STEM Center director in consultation with the STEM Center and Graduate School staff. Applicants are encouraged to contact the Director Sharon Locke (slocke@siue.edu) with any questions prior to submitting the application. Applications may be sent to Dawn Olive by campus mail to Box 2224 or via e-mail at stemadmin@siue.edu. Significance of project for informing STEM education practices at SIUE. Potential for findings of national significance. Clarity of project narrative and research question(s). Fit of project to STEM Center mission. Fit of project to faculty member’s expertise. Approval by Chair/Director and Dean. Final awarding of the fellowship is contingent on availability of funding in FY20. It is anticipated that the funded project will be suitable for a proposal submission to the National Science Foundation’s Improving Undergraduate STEM Education (IUSE) program; however, other funding programs are possible. More information on the IUSE program is available at https://www.nsf.gov/publications/pub_summ.jsp?ods_key=nsf17590 . Potential applicants are encouraged to consult with the STEM Center Director for any questions about potential external sources of funding. Undrah Baasanjav, assistant professor in the Department of Mass Communications, worked with the STEM Center to investigate the influence of digital technology on higher education among undergraduate students. Through analyzing the digital platforms that students use, Baasanjav aims to discover ways to better use digital media in the classroom. She hopes that this research will help faculty better design courses in ways that will encourage student learning and involvement through digital technology. Mingshao Zhang, assistant professor in the Department of Mechanical Engineering, worked with the STEM Center to continue development of a remote educational robotic system. This telepresence robot would allow teachers to interact with their students from a remote location. Zhang is investigating the possible effects that a telepresence robot has on student learning and perceptions of instructor credibility, particularly in STEM-related classrooms. A unique aspect of Zhang’s robots is that they are also equipped with features of social robots to improve the credibility of the instructor and usability in the classroom. Connie Barber, assistant professor in the Department of Computer Management and Information Systems, worked with the STEM Center to investigate the effects of gamifying a course as a means to engage students. Gamifying a course involves taking elements of a computer or video game and applying them to a classroom context. To gamify her course, Barber integrated a program called “Classcraft” with her curriculum. Through this course, students completed online learning activities related to the class. Sinan Onal, assistant professor in the School of Engineering, worked with the STEM Center to investigate how project-based learning enhances student engagement and retention in fundamental concepts of manufacturing. Through this project, students worked on problem-solving and teamwork skills by implementing the design and production of real-world medical devices. They did this in collaboration with the SIU Schools of Medicine and Dental Medicine. Thoshitha Gamage, assistant professor of computer science, worked with the STEM Center to introduce cybersecurity concepts throughout the program’s core curriculum, course that all computer science undergraduate students most take. Previously, students learned about cybersecurity during an upper-level course. With Gamage’s initiative, computer science core curriculum now features cybersecurity concepts so students are learning about cybersecurity more often and earlier in their education. 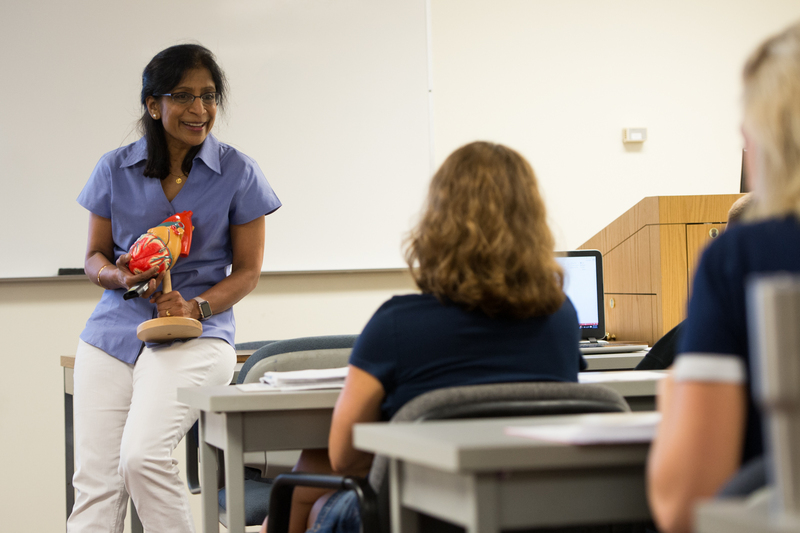 Chaya Gopalan, associate professor in the Department of Applied Health, investigated the effects of a flipped classroom on student success and knowledge retention. A flipped classroom is when students experience lecture content outside of the classroom and practice implementing that knowledge during classroom time. Through flipped teaching, students gain more practical experience tied to the concepts students learn. Gopalan taught one class the traditional way, and one class through a flipped classroom to examine the effects this teaching approach has on students. Kelly Barry is an associate professor in the Department of Biology. Through her work with the SIUE STEM center, Barry investigated the benefits of the SIUE Authentic Biology Research Experience, SABRE. SABRE is a lab experience for introductory level biology courses, a course where students tended to struggle. Barry developed a lab experience where students would develop the research skills needed to persist in STEM. Through her work with the STEM Center, Barry implemented 3 of these lab sections, in which students researched algae biodiesel production. Bangera, G. & Brownell, S.E. (2014). Course-based undergraduate research experiences can make scientific research more inclusive. CBE Life Sci Educ 13, p. 602-606. Graham, M.J., Frederick, J., Byars-Winston, A., Hunter, A.-B., Handelsman, J. (2013). Increasing persistence of college students in STEM. Science 27 341 (6153), p. 1455-1456. Kober, N. (2015). Reaching students: What research says about effective instruction in undergraduate science and engineering. National Academies Press. 500 Fifth Street NW, Washington D.C.